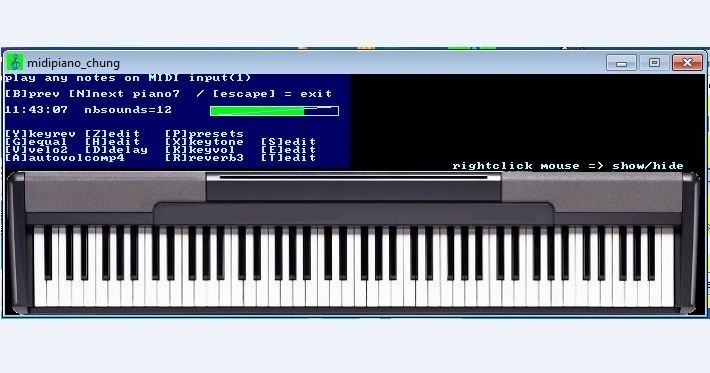 midipiano_chung is a standalone midi piano synthesizer which plays piano samples based sounds as midi data income in the selected midi input port (if any) of your computer. easily customizable by modifying the sound files in the ./sounds/ folder.The program is written in freebasic and uses fbsound with max 128 notes polyphony / 15 channels. Last edited by chung on Oct 01, 2011 8:51, edited 1 time in total. to avoid compilation warning(21) from fbsoundwin , and random crashes ? while the music keeps playing, with an attempt to draw the screen one row larger than expected. i have replaced it by "cls:locate 1" as locate is 1 based, works better ? you are using fbs_Sound_Speed() to play notes in different frequencies. is more a kind of micky mouse voice. You know what my bad english says ? same as YAMAHA, KORG, ROLAND etc. How ever i like your idea of an virtual piano. you have the choice to use the pitchshifter only once while you are load a new bank of samples. pitch shifter is not documented in the doc folder. speed +-30% is fast and dont modify the original sound. i am interested in piano sounds only because its the only sound i use with my midi player (midi_chung).All i wanted is to enhance the default midi GS Wavetable grand piano sound of the computer, and add sounds i can modify or record with a sound editor like Audacity (1 per octave). i have tested several free piano VSTi instruments with Cantabile_lite or VSThost ,but i think mine is better. you can even record your own acoustic piano and add it to the piano8..piano12 free banks (see readme.txt file). if you are interested, i can post a version with enveloppe editor (you can draw a gain curve with the mouse) but it doesnt sounds as well as the natural sounds.